In 2012, the Consumer Financial Protection Bureau (CFPB) issued Bulletin 2012-03 which places liability on any lending institution for the actions of their service providers as far as compliance with Federal consumer financial laws. 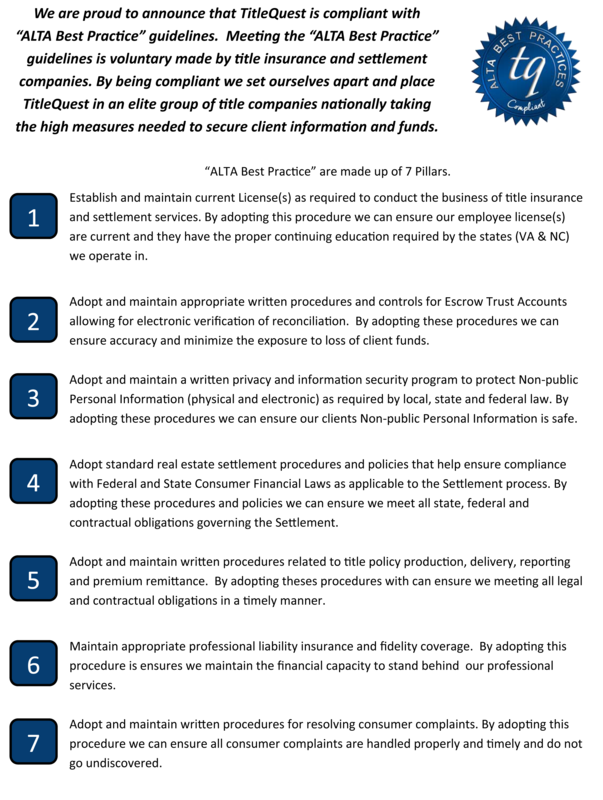 In 2013, the American Land Title Association (ALTA) released their "Pillars of Best Practices" framework for their members to adhere, enabling them to confirm compliance with the consumer financial laws and minimizing any compliance risks for lending institutions. Since that time, TitleQuest has been working diligently to verify that our internal controls, policies, procedures, training and auditing are such that TitleQuest is in 100% compliance with the Pillars of Best Practices. We view our relationships with our lender clients as partnerships and we take our role in the recent regulatory environment seriously. Our commitment to exceed the guidelines for compliance and business practices as set by American Land Title Association (ALTA), our underwriters, our regulators and our business partners allows us to aid our lender clients in complying with Federal consumer law and empowers the real estate settlement industry in protecting our most significant stakeholder – the consumer. 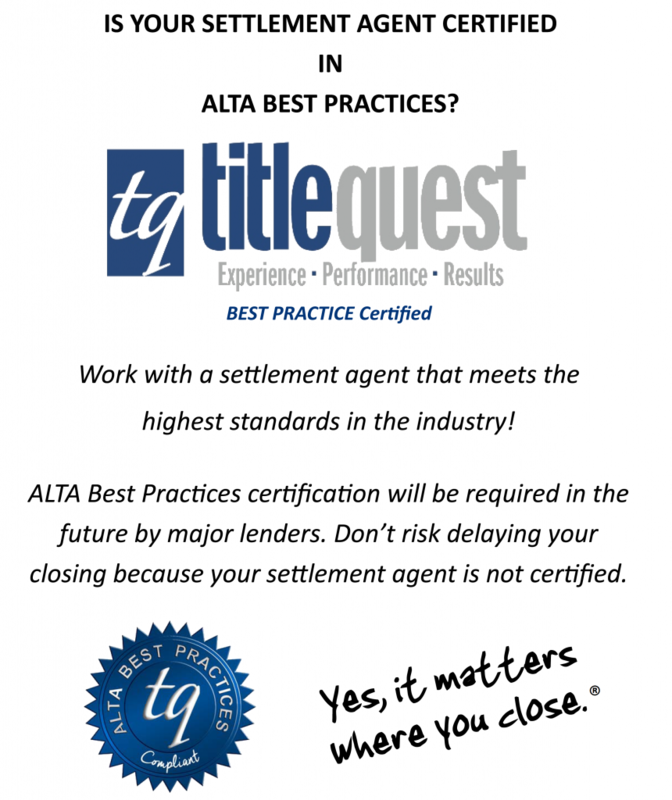 To learn more about ALTA's Pillars of Best Practices, please visit http://www.alta.org/bestpractices/ We want to hear from you… In the event that your experience doing business with TitleQuest was less than satisfactory, we want to hear from you. Please contact your local TitleQuest branch manager. 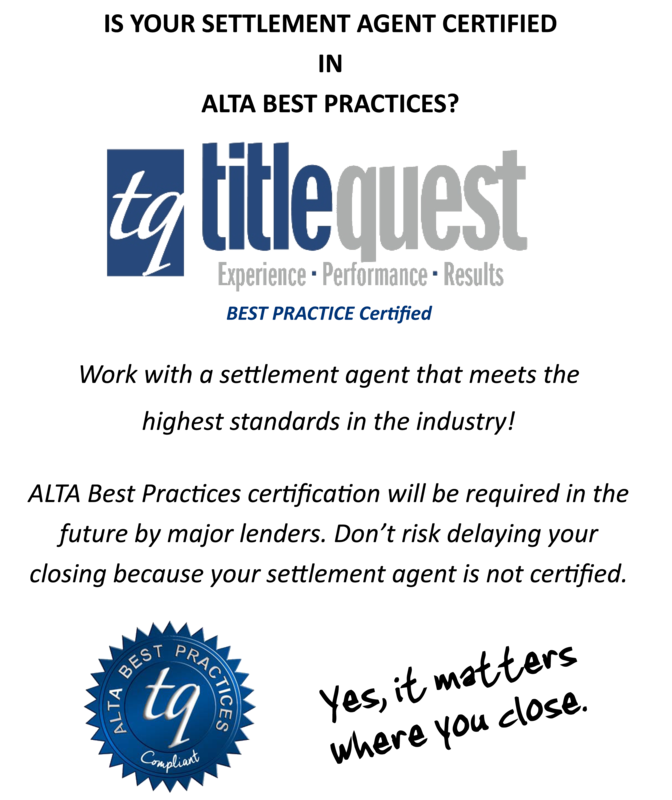 If you are a lender client who would like to request a vendor packet, please contact your local TitleQuest branch.